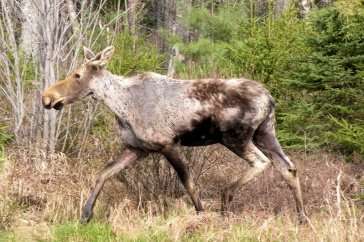 "The iconic moose is rapidly becoming the new poster child for climate change in parts of the Northeast," said Pete Pekins, professor of wildlife ecology. "Normally anything over a 50 percent death rate would concern us, but at 70 percent, we are looking at a real problem in the moose population." "We're sitting on a powder keg," said Pekins. "The changing environmental conditions associated with climate change are increasing and are favorable for winter ticks, specifically later-starting winters that lengthen the autumnal questing period for ticks." Fall is considered "questing" season for winter ticks. They climb up vegetation and look to attach to a host. Once they attach, they go through three active life stages (larvae, nymph, and adult) by taking a blood meal and feeding on the same animal. The ticks will feed and remain on one host during their subsequent molts until spring when adult females detach and drop to the ground. Their preferred hosts are moose and other mammals, including deer, elk, caribou, and occasionally horses and cattle. Winter ticks rarely bite and feed on humans.